The Underwater Preservation Tools and Techniques Class was very successful and well received. On Tuesday, 6-17 we held the classroom at Bob Olson’s workshop. We moved it from The American Air Wings Museum because of a last-minute conflict in the schedule. It worked out for the better because we could offer the students an opportunity to use and practice with the air tools that we use for GLSPS projects before using them underwater. This class is a very important part of the GLSPS Underwater Projects since the shipwrecks we work on are 70 to 100 years old! Some are falling apart and could be facing a condition that could easily become a debris field soon. The GLSPS was formed to help stabilize the shipwrecks to maintain their current condition and attempt to make them safer for everyone to dive on. Eight students signed up for the class, and the classroom session was very informative. Our instructor, Cliff Schmidt, showed us new procedures that would help make our underwater construction projects easier and safer. Cliff Schmidt is a commercial diver and marine surveyor. He has done things underwater that we could only dream of doing. The new UWPTT Class curriculum was completely redesigned by Cliff Schmidt, Bob Olson, and I. We also incorporated the GLSPS Safety Procedures and Standards Manual into the class, which is customized to meet the needs of the GLSPS underwater projects. The underwater session of the class was the best part. We used some of the GLSPS resources to accomplish this. 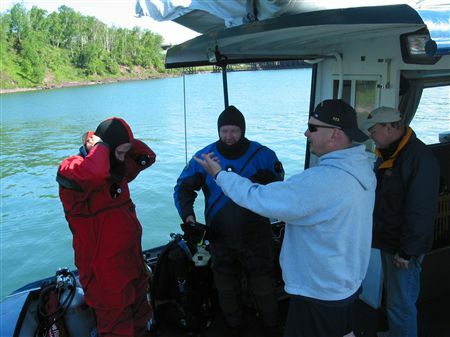 Ken Knutson and Bob Nelson cruised the “Preservation” to Two Harbors for the weekend to use as a dive platform for the class. What perfect condition than to work off the GLSPS workboat to learn how they perform these difficult tasks. We decided to have the tasks and skills part of the class on a shipwreck. What better learning platform than the S.P. 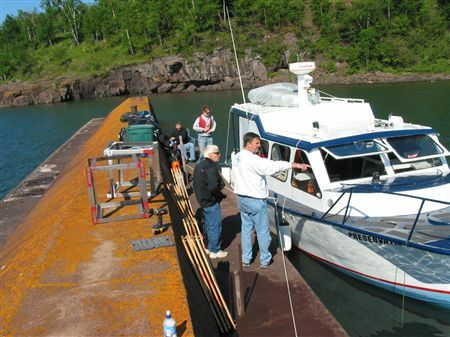 Ely near the breakwater in Two Harbors. This would provide a real world scenario for the students. We had a great staging area. It also provided lots of room for the fourteen people including students and the GLSPS training staff. The underwater portion of the class started off with the boat and dive team safety briefing, which are done on all GLSPS Projects. They are an intricate part of the safety standards involved with all GLSPS Projects. The first task that needed to be performed and completed with some degree of accuracy is the assembly of the wall. The wall was like a puzzle and could only be assembled one way. Also, each student took his or her turn being a tender. They had to help the dive team get ready for the dive, hand down the tools, and keep dive profile records of each dive. The other part of the tender’s job is to weight each board to sink them and to bring the board underwater to attach to the wall. This would also aid in not allowing the working diver to float back up to the surface again. The next task was disassembly and assembly of a steel cube. This task was required to test your finger dexterity, hand and eye coordination by using both air and manual ratchet wrenches. The other test that went with this task was being able to handle a bucket that had tools in it and weighed enough to throw off your buoyancy control. It was also a challenge to keep from dropping the pail and the tools. The final and most valuable task was two different lifts and weights with two different lift bag sizes. We attempted two lifts per dive team. The first lift was a smaller anchor and the second was a much heavier lift with a choker and surface supplied air and manifold assembly. The second lift was much more involved and dangerous than the first lift. Even though this was more of a simulated heavy lift, we still practiced it as if it was a very heavy lift. Everyone did great and passed the class. All students will receive a “GLSPS SPECIAL OPS” Certification for this class. I would like to thank Cliff for teaching the UWPTT class and others who helped make this possible. I would also like to thank the students for their interest in learning how to perform these difficult tasks to help preserve the shipwrecks of Lake Superior. All students and GLSPS training personnel had a good time. The class was so well received that we will need to offer another class next year. The cost this year was $160.00 per person to cover miscellaneous expenses and the instructor. The cost next year would most likely be the same unless gas costs increase. If you are interested in the UWPTT Class next year (June 20 and 21, 2009) please send me an email or sign up at the Gales of November 11-08-2008 or at the DIP Show on 02-28-2009. pkerber@glsps.org.